Botswana is a remarkable part of Africa and a must-see destination for adventure travelers seeking something fresh, engaging and inspirational. What are the top five safari destinations to see in Botswana and why are they worth visiting? Globetrooper takes an in-depth look. Botswana is located in southern Africa. The country has an abundant wildlife population and a fantastic ecosystem. The ecosystem has remained relatively untouched to this day. The country is teeming with wildlife and is home to the famous big five. The big five are the lion, elephant, rhinoceros, leopard, and buffalo. Here are five thrilling places in Botswana which any first-timer or even returning visitor to the game reserves should not miss while on an adventure safari trip. If the Pyramids are to Egypt, the Okavango is to Botswana. It is the world’s largest inland delta. Botswana is graced by unique forming waterways, amazing views, and a rich ecosystem. It is the most unique place to visit in the country. One of the best ways to experience the delta is to do a combined aerial and boat trip. 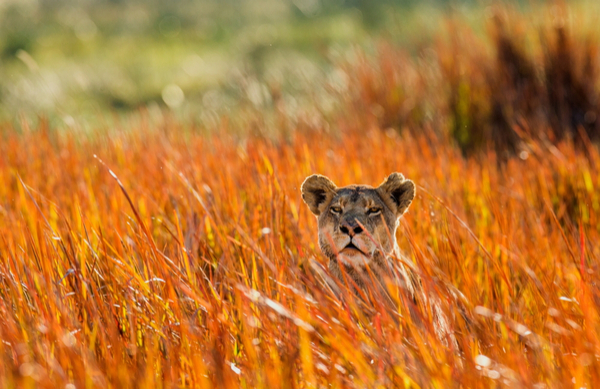 Organizing a safari in the Okavango would mean flying into Maun. You can set up base in the city or arrange for a tailor-made safari for a couple, a group or a family. The best option is to spend a few nights on a houseboat. It will allow you to fully experience what the Okavango has to offer. Chobe National Park in Botswana. Watering in the Okavango Delta. African elephants crossing the river in shallow water. There are several boat tour operators that will arrange for your stay on a houseboat. Most houseboat will include all transfers and meals. You can do day trips around some of the islands like Chief’s island, visit a heronry, do a mokoro (dugout canoe) trail or simply cruise up and down the delta. 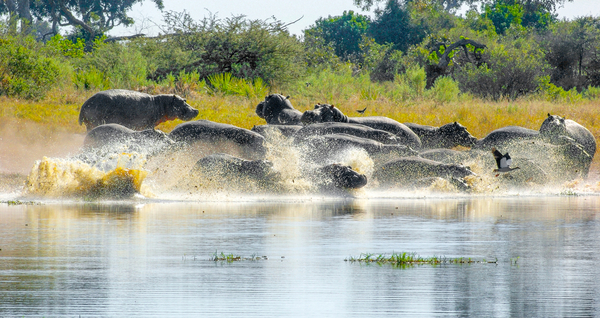 Hippos are abundant in the Okavango as well as elephants, lechwe, birds, buffaloes, and baboons. For the more adventurous, it is feasible to camp on one of the islands. There is a designated campsite for this authorized by the government. A permit is required and full provisions have to be brought especially the essentials, food, and water. As mandated by the Botswana government, all trash has to be taken back with you to maintain the pristine state of the area. Adjacent to the Okavango Delta is the Moremi Game Reserve. Here, you will experience the prolific animal life that the country has to offer. There are plenty of lions in the area which makes it worth visiting. If you are lucky you might just witness a “kill” or the birth of an antelope. The shy leopard can also be spotted here napping or sleeping on one of the trees. The roads are not accessible during the rainy season and a 4 wheel drive is indispensable for traveling. While in Moremi, it is recommended to see the neighboring areas with Linyanti, Savuti and Kwando. Lots of cheetah sightings occur in these places. If you are staying in one of the concessions, chances are you will see these animals. You have to bear in mind that Botswana’s national parks are unfenced. That makes tracking animals exhausting and a game of chance. Luxurious camps in these vicinities cater to a small group of people. It will make you feel like a special guest and not simply a paying tourist. However, because of the possible dangers and threats that animals might pose, there are campsites which do not accept children of a certain age. While others do not accept children below 12 years at all. 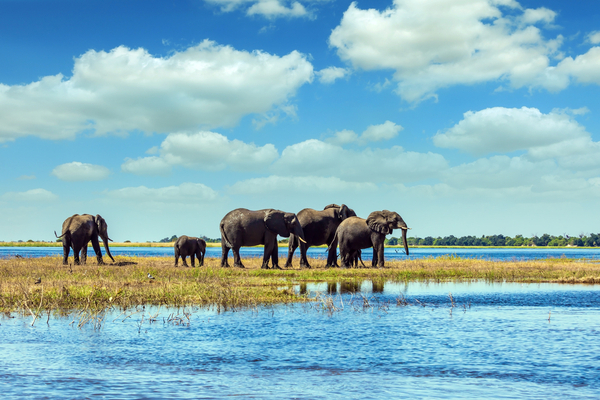 Further to the north of Botswana is Chobe National Park. To get there, you have to fly to Kasane from either Gaborone or Maun. It is also possible to get a flight straight from Johannesburg, South Africa if you intend to make Kasane your first safari stop. 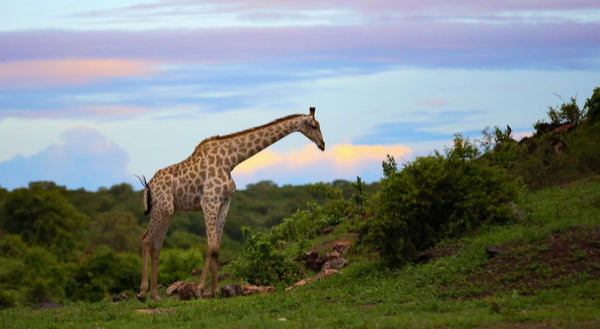 A Giraffe at sunset in the Chobe National Park, Botswana. Finding an accommodation in the area is easy as there are many lodges and guest houses in and around Kasane. Most of the lodges offer game drives to the Chobe National Park and these are usually half or day trips. 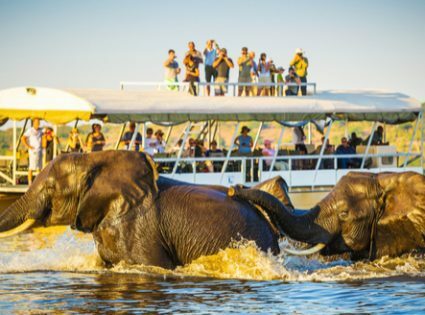 A sensible alternative is to combine a game drive with a cruise on the Chobe river. Doing so would increase the chances of seeing more animals on the banks of the river. Also, animals in the water like crocodiles and hippos. Some of the animals you will see are elephants, giraffes, antelopes, baboons, zebras to name a few. As a side trip, you can also do an excursion to the Victoria Falls in neighboring Zimbabwe. You can arrange a tour trip to your lodges or hotels in Kasane. Spectacular light shows, cloudless, clear, starry nights and a serene almost eerie calm? This is the Kalahari Desert. About 70% of Botswana is desert. The Kalahari Desert also traverses to neighboring countries like Namibia and South Africa. It has a variety of unique flora and fauna with the black-maned lion as the main attraction. Apart from this elusive creature, you can also spot rhinoceros, antelopes, ostriches and honey badgers. Accessible through several entry points, the Kalahari can be experienced by visiting the Khutse Game Reserve. You have to camp if you want to stay inside the reserve or stay in the only lodge a few hundred meters from the entrance. 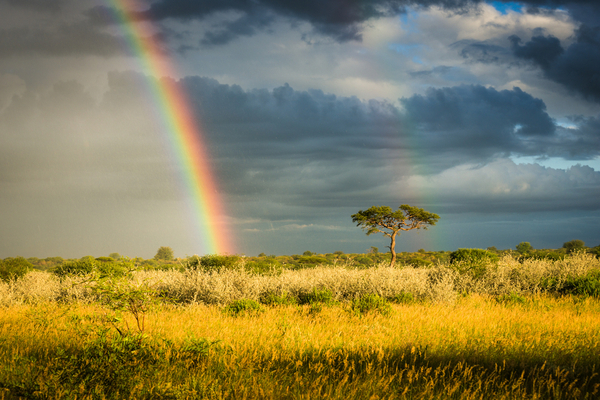 Rain and a rainbow in the Kalahari Desert, Botswana. The evening, a solitary tree. The other alternative is to do a safari to the Central Kalahari Game Reserve either by camping or staying at the Tau Pan Camp. This is the only camp which has been granted concession inside the reserve and is a prudent way of visiting the Central Kalahari. Unless you are a seasoned camper, embarking on a safari on your own is quite tricky and not advisable for safety reasons. If you are based in Tau Pan Camp, you can do multiple trips around the area to see the picturesque Passarge Valley, Leopard Pan, Sunday Pan, and Deception Valley. The staff at the Tau Pan Camp will arrange game drives to these places on request. You can get to the camp from Maun by flying. If you still have the energy and the means to do another trip in Botswana then consider an expedition to visit the Makgadikgadi Pans. Although there is a vast expanse of area to see, the most interesting attractions are the salt lake pans and the Nxai National Park. There are lodges which are located on the fringe of the park where you can arrange activities. You can spot plenty of flamingos in the lagoons in addition to the numerous species of birds. Depending on the season, you might also get the chance to see the amazing migration of zebras and wildebeest in search of water. If you leave Botswana and have taken the time to see all of these five magnificent places, you can truly say that you have experienced the best of the country by no small margin. As a tip, try to avoid the capital city of Gaborone. The city does not have a lot of exciting places to see over. However, if you happen to land in the capital, there are also minor attractions around the vicinity such as the Mokolodi Nature Reserve, Gaborone Game Reserve and a trip to see the vultures in Manyenalong. In fact, it might not be a bad idea to start with small game drives in preparation for the big safari you are about to embark upon. Clearly, safari adventure does carry a small amount of risk. Risk due to the proximity to some of the immediate wildlife and other factors. To this end, we recommend a specialist guided tour and there are many companies on the Internet that specialize in tailor-made safari tours with bespoke itineraries. 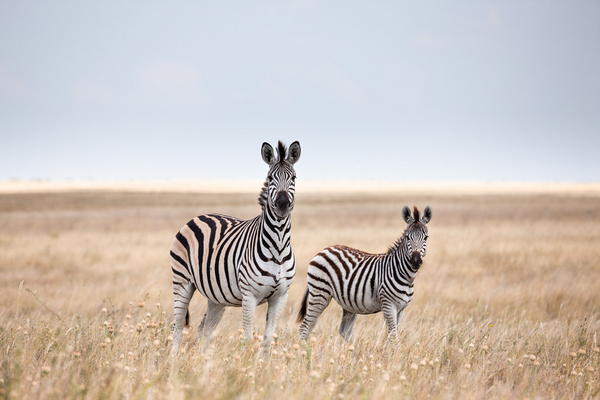 This tour route for a safari trip is generally far safer and has the added benefit of being able to tap into the experience and knowledge of your tour guide. An experienced safari tour guide will be familiar with the land, the animals and the people and will ensure that you experience the safari adventure safely and see all the best landmarks and parts of the game reserve. Typically a tour company may offer ‘Safari Package Tours’ that comprises of flights, accommodation, meals and a full guided safari itinerary. If you are new to safari’s and game reserves this is the specialist tour route that we would recommend for the ultimate Botswana safari experience. Going with a small group of people is the best way to experience the safari.